When her mother is knocked down and killed by a London bus, fifteen-year-old Melon Fouraki is left with no family worth mentioning. Her mother, Maria, never did introduce Melon to a 'living, breathing' father. The indomitable Auntie Aphrodite, meanwhile, is hundreds of miles away on a farm in Crete, and is unlikely to be jumping on a plane and coming to East Finchley anytime soon. But at least Melon has 'The Story'. 'The Story' is the Fourakis family fairytale. A story is something. 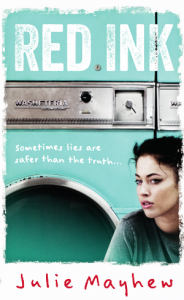 RED INK is a powerful coming-of-age tale about superstition, denial and family myth. I picked up a copy of Red Ink by Julie Mayhew in the library after it was recommended to me by a friend. This isn’t a very high profile book. It was sent to my friend, who also writes a book blog, by Hot Key books , and she couldn’t give it more praise. And after reading it neither could I. I didn’t know what I was getting into with Red Ink, and I could not expect the effect it would have on me. It is without a doubt the best contemporary YA novel I have ever read. The novel follows Melon, a fourteen/ fifteen year old girl in the time leading up to and after her mother’s sudden and unexpected death. The novel is definitely a coming of age story, and Melon under gos some of the best character development I’ve ever read in a YA contemporary novel. Melon begins the novel as a child, and by the time it ends she is a young woman. Melon develops and grows so much over the course of the novel, and it seems very intimate to see her become a strong, independent, wise, young woman. I identified quite a bit with Melon. Although she was younger then me , we have the same dark, cynical sense of humour and the same insecurities. She is without a doubt one of my favourite characters , not because she reminds me of myself, but because she is so real. She isn't one of those martyred YA heroines, who is perfect except for their insecurities about their height or weight, who is actually so pretty when some boy tells her to take her glasses off. Melon is strong and flawed, and I am so full of admiration for her resilience but also her reliance. Melon felt like if she were real, we would be best friends, and what more could you want in a protagonist. There are a few very interesting relationships in this novel, the first being Melon’s relationship with her best friend Chuck. In a nutshell, Melon’s mother doesn’t approve of her relationship, and Melon can’t really figure out why, but it becomes apparent before long. An even more interesting relationship is that of Melon and her mother’s boyfriend Paul. Everyone is surprised by this particular relationship, the social workers are suspicious and even Melon doesn’t understand it. But Melon and Paul are family, even if they are an odd sort of family, and through them Mayhew effectively conveys the idea that family comes in all shapes and sizes. The central theme in this book is loss of innocence and the idea that both Melon and her mother Maria grow up too quickly. It was quite difficult to watch Melon’s childhood be taken away from her because of her mother’s death, and the same goes for her mother when she falls pregnant with Melon at the age of fourteen. The novel also, obviously enough, deals with the theme of death and how we come to terms with the death of a loved one. This is one of the most accurate depictions of grief and loss I’ve ever read, and I felt a deep sense of sympathy with Melon as she struggles to come to terms with her mothers death. The story has an intentional and very effective fairytale quality which I absolutely loved. The narrative is punctuated by the story ( The Story ) Maria tells Melon, about her childhood in Greece, Melon’s father and how Maria came to London. The story is told in third person and narrated like a fairytale, which gave it a mysterious quality which greatly contrasted with the gritty realism of the rest of the novel. Through this “fairy tale”, Mayhew deals with the idea of truth, and how we bend and manipulate it in order to protect our loved ones, ( I hope that’s not a spoiler). I have a few tiny problems to pedantically complain about for a second. The novel is very slow to begin with, and it didn’t hold my attention to begin with. It took me a good few tries to settle into it. Similarly, the plot is told in a non linear fashion, flashing backward and forward around the death of Melon’s mother. I found that this made it very difficult to follow the plot, especially because Melon’s character changes so much over the course of the story that it sometimes felt that there were two different characters narrating. Overall, a thoroughly enjoyable and thought provoking read and I highly recommend it to lovers of YA contemporary books. You will not regret reading this! !